Bellwether data signals revival in manufacturing, Indian economy. Manufacturing Purchasing Managers’ Index grows at fastest in five years. The Nikkei India manufacturing Purchasing Managers’ Index (PMI), a bellwether of economic activity, grew at the fastest rate in five years in December. 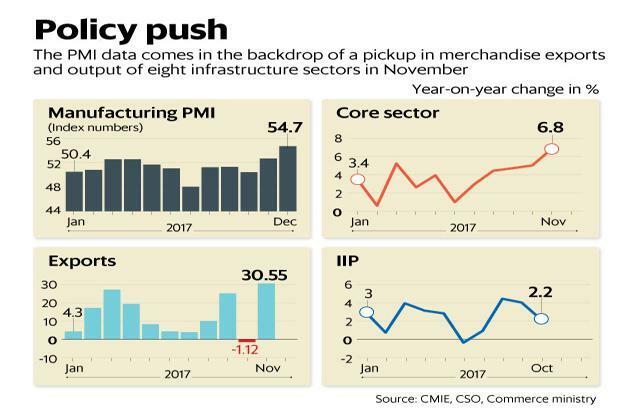 Coming in the backdrop of a pickup in merchandise exports and output of eight infrastructure sectors in November, this has stoked expectations of a sustained revival in the Indian economy. The manufacturing PMI rose to 54.7 in December from 52.6 in the previous month. A reading above 50 denotes expansion and one below it signals contraction. The manufacturing PMI is based on data compiled from monthly replies to questionnaires sent to purchasing executives in over 400 industrial companies in India. Merchandise exports grew at a six-year high of 30.5% in November while the index for core sectors expanded at its fastest pace in 13 months at 6.8% during the same month. India’s gross domestic product (GDP) growth accelerated to 6.3% in the September quarter of 2017-18 after dropping to a three-year low of 5.7% in the June quarter on the back of demonetisation and uncertainty surrounding the implementation of the goods and services tax (GST) from 1 July. Most analysts expect economic growth to pick up in 2018 on the back of a continuous global recovery and improved manufacturing activity. The Reserve Bank of India expects growth, as measured by gross value added, to pick up to 7% in the December 2017 quarter and to 7.8% in the March 2018 quarter. The Central Statistics Office (CSO) will release the first advance estimates of GDP for the current financial year ending 31 March 2018 on Friday, which will act as the benchmark for most indices in the 2018-19 budget to be presented by finance minister Arun Jaitley on 1 February. Aashna Dodhia, economist at IHS Markit, said India’s goods-producing economy advanced on its recovery path, with operating conditions improving at the strongest pace since December 2012. “Strong business performance was underpinned by the fastest expansions in output and new orders since December 2012 and October 2016 respectively. Anecdotal evidence pointed to stronger market demand from home and international markets,” Dodhia added. In November, passenger vehicle sales grew at 14.3%, the fastest pace since July, on the back of a low base effect due to the demonetization of high-value banknotes in November 2016. However, sceptics point out the short-lived boom in factory output, which grew more than 4% for two consecutive months in August and September, driven by restocking of warehouses, only to moderate to 2.2% in October. Dodhia said challenges remain as the Indian economy adjusts to recent shocks, but the overall upturn was robust compared with the trend observed for the survey. “This outlook was shared by the manufacturing community as sentiment picked up to the strongest in three months amid expected improvements in market conditions over the next 12 months,” he added. Industry lobby group Federation of Indian Chambers of Commerce and Industry’s (Ficci’s) latest quarterly survey on manufacturing, released on 19 December, suggested a slightly less optimistic outlook for the manufacturing sector in the month as the percentage of respondents reporting higher production in the fiscal third quarter had fallen compared with the previous quarter. The proportion of respondents reporting higher output growth during the December quarter fell to 47% from 50% in the September quarter, according to the survey. However, the percentage of respondents reporting lower production also came down to 15% in the third quarter from 18% in the second quarter.